These "French Toaster Sticks" are pretty fun. They have a great maple flavor and their texture is reminiscent of real French toast. It wasn't hard to sell me on this product. When it comes to snacking, your buddy Mr Breakfast puts wheat toast with honey on the same list as chips and chocolate. So French toast as a quick-snack was a no-brainer. 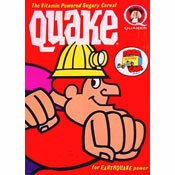 However, this product as an actual breakfast - a meal - is a different story. One piece of of toast (which breaks apart into three sticks) satisfies a sweet snacky craving, but two pieces (six sticks) is a bit much on the sweet tooth. I found myself thinking of real homemade French toast and missing those occasional bites that don't get as much syrup. I'd never really ruminated on the complexity of French toast before. But it really is the uneven balance of sweet and savory that turns bread slices into a completely wonderful new entity. In this product, every bite is the same. Thankfully, they are tasty bites... but in the end, it feels boring. Even the mix-em-up of the often-less-desirable bread crust is missing here. It has a crust shape, but it's the result of molding. Think how McDonalds makes McRib sandwiches look like ribs but it's actually molded meat. For as much as I like the flavor and texture, this product also misses the boat for me on the basis of it's concept. French toast sticks were invented for dipping. A little ramekin of warm maple syrup and homemade French toast sticks are a real fun treat... more real and more fun than you get from this box. 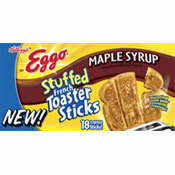 I'd love to see the Eggo guys come up with real French toast sticks made from real bread... nothing fancy, nothing stuffed... just good French toast and then... here's the magic... provide little microwavable containers of maple syrup, or better yet... a sort of maple cream dipping sauce along the lines of the drizzle on Toaster Strudels. Hmmmnn... wow... that's gonna send me to the test kitchen right after I write this. I found a few negative things to say about Maple Syrup Stuffed French Toaster Sticks but my overall impression is a favorable one. I'm going to recommend this new product as snack. A slice (3 sticks) provides a smattering of vitamins and minerals - certainly more than you'd get from most chips or a candy bar. One word of warning: The directions advise you to toast these on your toaster's lowest heat setting and says "two toastings may be required". They're not kidding. I tried toasting on the medium setting and the middle of the toast still had some unpleasant cold spots. Two toastings on medium-low gave me the best results. What do you think of Maple Syrup Stuffed French Toaster Sticks? I LOVE these! The last time I bought them was in 2008 at WalMart. Haven't been able to find them since! Where can I buy them?! OMG, I love these! I finished the whole box in less than 4 hours! Once u have one you'll crave more. They're so simple & kinda boring but fun to eat. This is a very innovative idea. It's mess free and very convenient. And they taste really good too! I want them because I do not see them in the store.